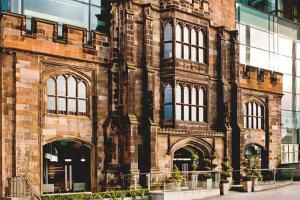 Housed in the historic Lady Glenorchy Church building, The Glasshouse Hotel stands out as a landmark in the heart of Edinburgh. The hotel features cozy-contemporary interiors, warm Scottish service and consistently spectacular views of the city, Carlton Hill or the hotel’s two-acre rooftop garden. Most of the 77 rooms and suites benefit from floor-to-ceiling windows, and some have private terraces. Enjoy an elegant meal at the exclusive Glasshouse Brasserie with its dramatic glass-walled dining space and views of Carlton Hill. The hotel is approximately a 30 minute drive from Edinburgh Airport. By tram, The Glasshouse is a 40 minute trip from the airport. Princes Street, Royal Mile, George Street, Carlton Hill, Edinburgh Zoo, Edinburgh Playhouse Theatre.